Freddy & Francine is an Americana-Soul duo comprised of Bianca Caruso & Lee Ferris. With voices reminiscent of Aretha Franklin & Van Morrison, their songs blend Soul, R&B, Folk, and Americana with a modern, yet timeless appeal to all ages. Based in Los Angeles, Ferris and Caruso met in the 40th Anniversary of a musical production of HAiR in LA in 2007. As individuals, Caruso developed a comedy television show with ABC and Ferris racked up 500 performances as Carl Perkins in the Broadway musical Million Dollar Quartet. 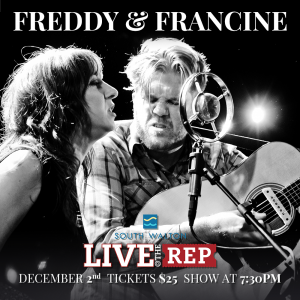 ​ Freddy & Francine have released 2 EPs & 3 full length records since 2008. Their latest, “Gung Ho” was produced by renowned producer Todd Sickafoose (Ani DiFranco, Andrew Bird, Anais Mitchell) and featured members of Ryan Adams, Rufus Wainwright, and Andrew Bird’s touring bands.